What I liked about this novel was that it managed to hold my interest clear through to the end. So many novels I pick up now days don’t. With Risen: A Supernatural Thriller, I struggled some with the slow beginning and there were a few areas where the pace lagged unnecessarily (and I started to skim), but once the action got started, I breezed straight through to the end. It managed to do what a good horror is supposed to do in my opinion—give me the heebie-jeebies and keep me guessing about what exactly is going on to an interesting/surprise ending. I like zombie stories and I considered this one a zombie story with a HUGE twist. The story is told through multiple points of view, which would usually bother me, but in this case I felt it worked. Instead of the story revolving around one or two characters, it took in all the residence of a small town named Anderson. Though there were several areas where head hopping was going on, for the most part the multiple points of view helped me to keep a name with a face and personality rather than two dimensional stick figures. The town of Anderson might not be huge, but we are still following a rather large group of people. Multiple points of view helped me understand how they related to one another before the trouble began. What I didn’t like so much were too many unanswered questions left hanging. I liked how the antagonist was dealt with, but I never really understood where Seth originated from or how he got the power to resurrect these dead bodies in the first place. Theories were brought up, but never a satisfactory answer given. I didn’t understand the motive behind the killings. What did Seth have in mind once all the residents were under his control? Why was it important for certain individuals to kill particular people when others could kill anyone they wanted? I was made to feel certain individuals were killed for a reason, but the reason was never brought up again. An example would be the nudists. A lot of pages were given to the killing of these people and then nothing more after they rose. I had more questions, but they didn’t bother me as much as not understanding who Seth was and the motive behind his frightening actions. There is much more to this story than your typical reanimated corpse. If the questionable areas had been made clearer, and more care taken with editing of punctuation and grammar to help tighten the text, I would have happily given this a five star rating over three. Perhaps there is a sequel planned in the near future and my questions will be answered there (I’m hoping anyway). I’ll look forward to reading more work by Jan Strnad. 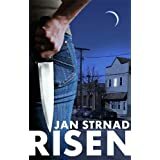 Posted by Denna Holm on November 18, 2012 in Archives and tagged chilling, gods, Horror, reanimated, risen, snapped, suspense, tense, thriller, zombies.